Nikos Giannopoulos (left) posed with President Donald Trump and Melania Trump in the Oval Office. WOONSOCKET, R.I. — This state’s teacher of the year wanted to show his students they should be comfortable with who they are, even if they are meeting a US president who has rolled back protections for transgender students. 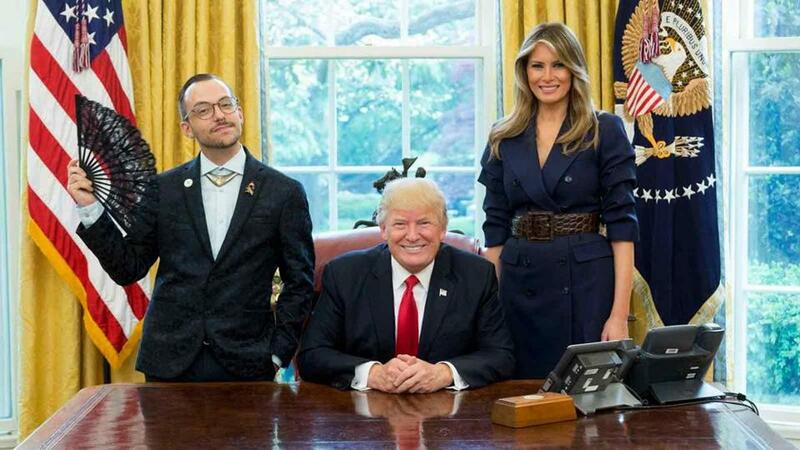 So as Nikos Giannopoulos, 29, entered the Oval Office in April, he decided to deliver his message with an ornate black lace fan and a rainbow lapel pin. “I popped it right open as soon as I walked in and began fanning myself,” said Giannopoulos, who is gay. Neither President Trump nor the first lady, he said, had a problem with the fan, and moments later he posed for a photo with them in dramatic fashion, holding the fan wide open, tilting his head, and shifting his hip to one side. The picture, released last week by the White House along with images of the rest of the nation’s teachers of the year, went viral, gaining more than 20,000 likes on Facebook and attracting international media attention. Giannopoulos, a special education teacher at the Beacon Charter High School for the Arts, said he’s happy the moment has drawn attention to the needs of LGBTQ students but is surprised that it has reverberated around the globe. “I knew my students and my colleagues would like the picture, but I didn’t think it would blow up like that,” he said. Giannopoulos’s students say they appreciate his gesture. 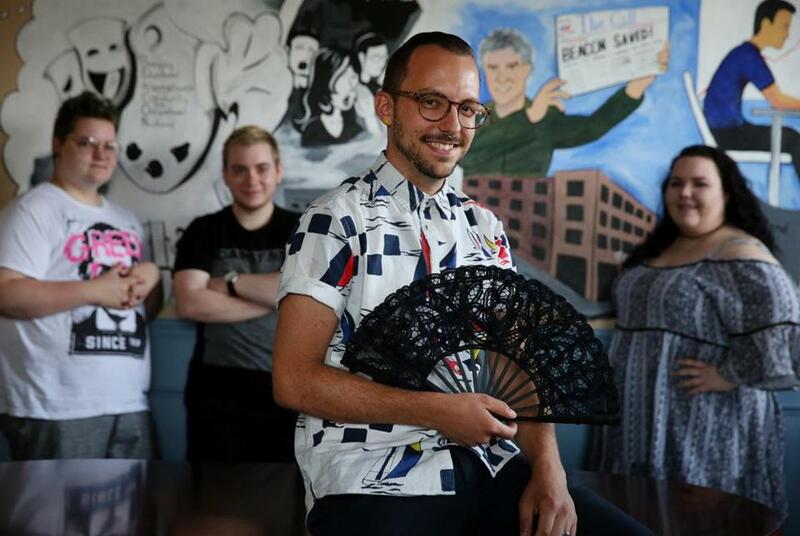 Since being named teacher of the year, Giannopoulos has been on a mission to raise awareness about the issues facing LGBTQ students, he said. He also has been trying to draw more attention to the plight of students experiencing trauma, whether because of abuse happening in their homes, at school, or elsewhere in their communities. So it was with disappointment that he saw LGBTQ students losing ground. First, Trump appointed an education secretary, Betsy DeVos, whose foundation had donated to several organizations that support gay conversion therapy. DeVos denied during her Senate confirmation hearings that she supported such programs. Then in February Trump rolled back protections for transgender students, reportedly overruling objections from DeVos. The moves, Giannopoulos said, were surprising from a president who voiced support on the campaign trail for policies that allowed transgender adults to use bathrooms that reflect the gender they identify with. Giannopoulos said he flirted with the idea of boycotting the photo op, but was concerned that no one would know why he bowed out. 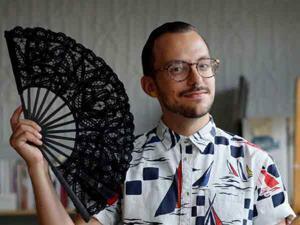 Instead, he decided to bring along the black lace fan, which he snagged from his partner a few years ago and has taken on trips across the country — especially in extreme heat. “If you want to cool down and look fabulous, why not?” he said. His approach to life, he said, is “to keep it light and happy,” because life was not always easy when he was growing up in Pennsylvania. Giannopoulos, who graduated from high school in 2006, said other kids taunted and bullied him for being gay or, in his younger years, for being perceived as gay. “I didn’t let it bother me because I had self-confidence,” said Giannopoulos, who credits his parents for encouraging him to be who he wanted to be. But he added that a lot of kids don’t have that kind of family support, which is why he wants to be a role model for his students. Giannopoulos advises the Gay Straight Alliance at his school. Liam Fifer, 18, president of the group, said Giannopoulos’s support meant a lot to him, as well as to everyone else at Beacon Charter. Fifer, who is transgender, transferred to Beacon Charter in the 10th grade, when he was transitioning, and said it would have been difficult to do that at a large comprehensive high school. Giannopoulos wrote about the impact of Fifer’s experience on him in his application to be teacher of the year, and he carried that story inside him when he met with Trump, outraged that he had rescinded rules that had helped to protect students like Fifer elsewhere. “What is concerning to me is that a child who is fully loved and supported in these walls might not be in other schools,” Giannopoulos said. When Giannopoulos walked into the Oval Office, Trump was unfazed by the fan and, in fact, complimented him on it, he said. A handler, however, who was seeking a uniform look for photos of teachers of the year asked him to put it away. Giannopoulos initially complied, but then turned to Trump and politely asked if he could pose with it. Trump was OK with it. As Giannopoulos struck his pose, Trump, the onetime reality television star, sat behind his desk with a big grin. Melania Trump, a former fashion model, stood next to him, also smiling. But the students said Trump shouldn’t get much credit for letting Giannopoulos use the fan. If the president truly supports the LGBTQ community, he should be fighting for their rights rather than pulling them back to appease some supporters and advisers, they said. Rhett DelPino-Morgan, 18, called Giannopoulous’s move sassy. “It was a queer one-up to the president,” she said. Rhode Island’s teacher of the year Nikos Giannopoulos posed with members of Beacon Charter High School’s Gay Straight Alliance (left to right) Rhett DelPino, Liam Fifer, and Julie Alden.